My very own Congressman, Steve Stockman, is working hard for Texas and America. 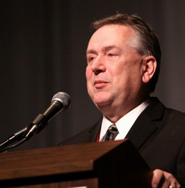 Congressman Steve Stockman was first elected to Congress in the Republican Revolution of 1994. He beat long-time US Representative icon Jack Brooks. Stockman has not been in Congress for over a decade, but now he is back after winning handily in the new Texas Congressional District 36 in east Texas. Stockman came in with boots on the ground and ready to fight for conservative values. One of Stockman’s first votes was to not vote for John Boehner as the Speaker of the US House of Representatives because Stockman believes we need a stronger conservative leading the Republican-controlled House. Stockman does not stop there. One of the early bills he has filed is a bill to repeal gun free zones or “killing zones” because they are just places where massacres happen because shooters know that no one has a gun to be able to shoot back to protect themselves. Knowing that he will likely not get any gun control bills passed through the Republican-controlled US House of Representatives, President Barack Obama has made it known that he will use executive orders to enact gun control measures in America. Congressman Steve Stockman took little time to respond to Obama. Stockman did not try to beat around the bush or play nice or compromise like many Republicans like to do. He warned Obama that any gun control executive orders that side-step Congress are unconstitutional and would result in Stockman filing for Obama to be IMPEACHED. New Texas U.S. Senator Ted Cruz has also come out swinging. Ted Cruz has defended gun rights and calls the new gun control proposals "Unconstitutional." The freshman congressman, who served one term in Congress in the mid-1990s, further labeled the possibility “an existential threat to this nation” because, he said, the purpose of the Second Amendment is to allow the people to protect themselves from tyranny. “If the president is allowed to suspend constitutional rights on his own personal whims, our free republic has effectively ceased to exist,” he said. I support Congressman Steve Stockman! I've just been inspired to move to Texas!